It was late on Tuesday evening when Sussex academy graduate Tom Haines received the unexpected call to play against Durham in the Specsavers County Championship Division Two match against Durham. He had played only two championship matches before, both in 2016, when he scored 12 runs in three innings, so he must have felt he was making his debut all over again. 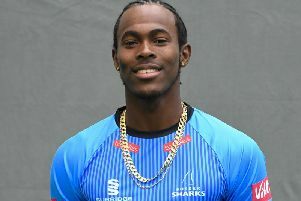 But the 19-year-old left-hander – called in to replace England Lions call-up Chris Jordan - responded by scoring a memorable maiden first-class century at Arundel Castle Cricket Ground, featuring in a record second wicket stand of 244 in 54 overs with Phil Salt as Sussex piled up 439 for five. Salt also scored his maiden century at this level as the pair celebrated beating the previous record second wicket stand against Durham of 196 between Bill Athey and Alan Wells at Hove in 1996. Before the match the Sussex head coach Jason Gillespie has asked his top five to improve on what had been a disappointing start to the season. “We haven’t quite nailed it in the top five,” he said. Sussex went into this game with their batting averages led by all-rounder David Wiese. And they were also without highly rated Stiaan van Zyl, who is missing this match with a knee injury. But Gillespie could not have envisaged this response from a Sussex side, even though they were batting on a relaid and flat looking surface. Durham looked in the mood to make the most of the uncontested toss when they took the field under sullen skies. And they made a quick breakthrough when Luke Wells was caught by Tom Latham at second slip off Matt Salisbury for eight in only the fourth over. Haines and Salt, who went into this game with a championship average of 17.33, could have been forgiven for playing cautiously. But instead they took the attack to the Durham bowlers. The aggressive Salt is better known for his exploits in the white ball game, but Haines matched his tempo. Haines was second out at 253, caught low down at slip by Paul Collingwood for 124 from 167 balls, with 19 fours. Salt followed in the first over after tea, caught at third man for 130 from 175 deliveries, with 18 fours and a six. After that Harry Finch, with a rapid 56, Luke Wright, Ben Brown (50 not out) and Michael Burgess all enjoyed themselves in the afternoon sunshine. Collingwood and Chris Rushworth are the only survivors from the Durham side who last played here – and won – in 2015. Here, Collingwood returned to the side after injury, and Stuart Poynter also came in after his duties with the Ireland team. But Durham still looked decidedly second best on the opening day.